Once upon a time, I spent a few very cold January weeks in Central Europe, and I'm sure part of the reason for my survival (and overall great time) was the goulash. It came in many variations, all pretty good. My time in Budapest only reinforced my love for stewed meats Hungarian-style. 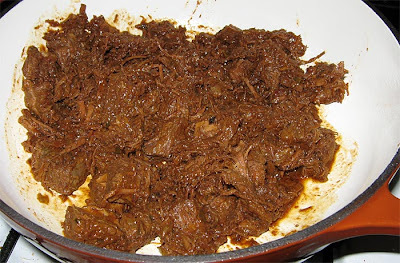 Yesterday I make a pörkölt, which is Hungarian for roast, and is a cousin to goulash (gulyás). Stew beef, paprika (hot and sweet), a bunch of onion, and caraway seeds. Stewed for a real long time. Rich, deep flavor, great with a side of potatoes or dumplings.